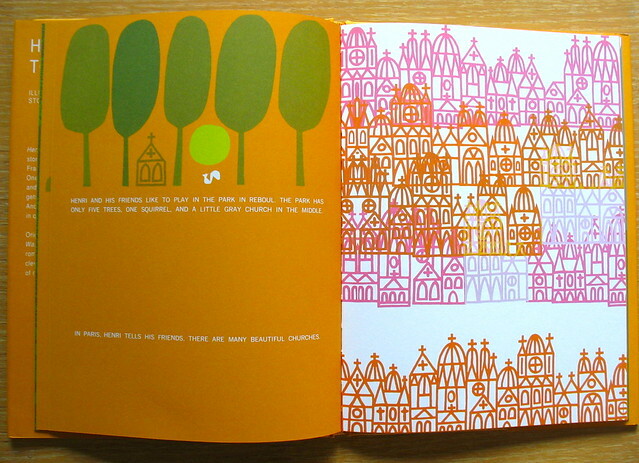 Henri's Walk To Paris, Illustrations © 1962, 2012 by Saul Bass and text by Leonore Klein, Universe Publishing, 2012. 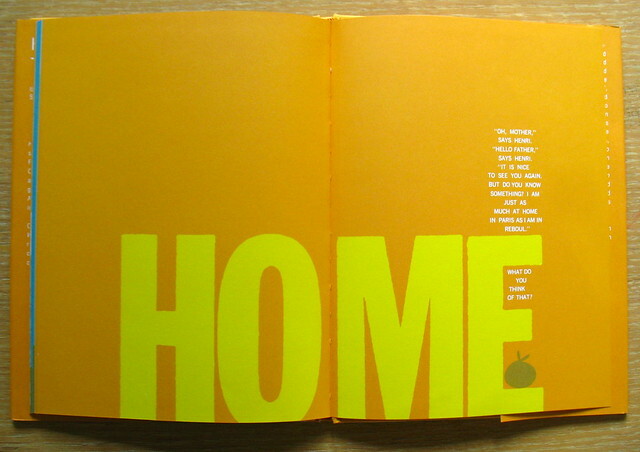 As you might've expected, it's heavy on graphic design brilliance. 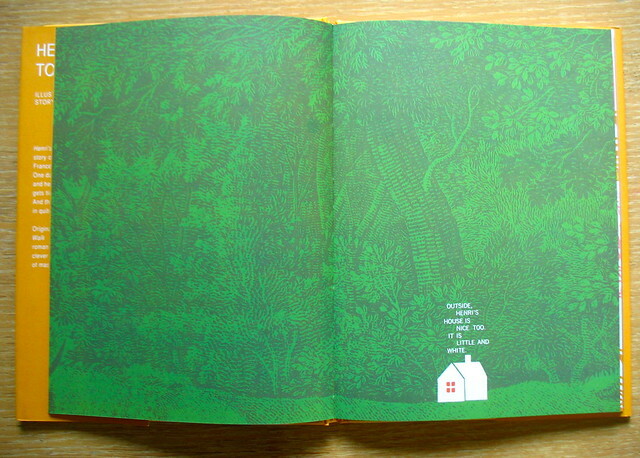 Bass uses the layout of each spread to evoke a particular mood - whether it's filled with foliage from some unknown source (I can't imagine Bass doing the actual drawings of the trees and bushes in the background here), or with a single sentence. 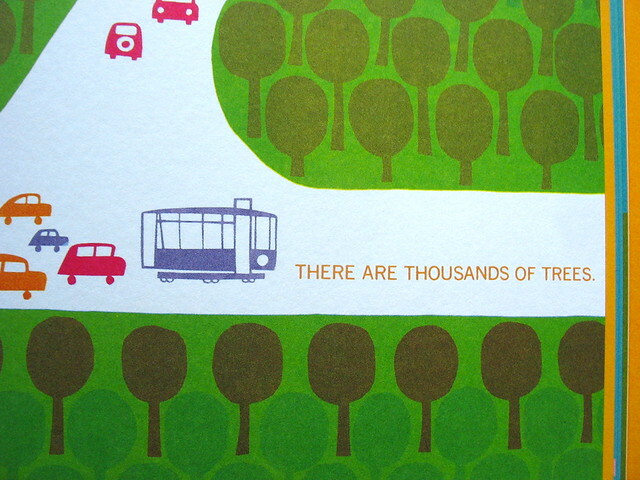 But one thing stuck out in my mind as I read through the book several times: there are no people. Well, there are "characters," but Bass doesn't actually depict a real human being aside from a crowd featuring circles with hats, a few well-placed arms and feet, and a couple of cropped legs. 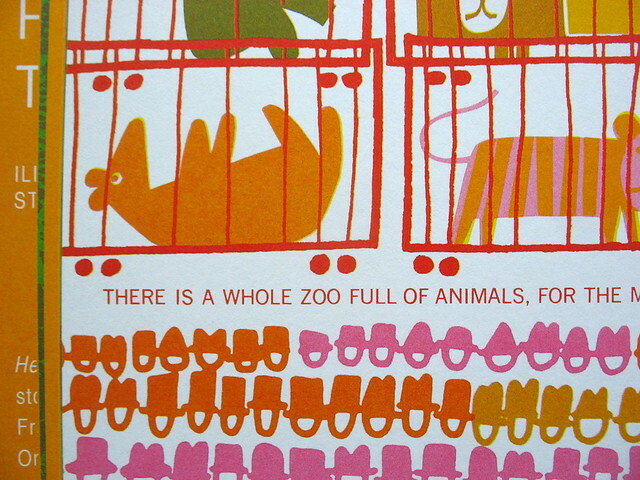 Saul Bass does what he's good at: he simplifies elements to their basic shapes and symbols. 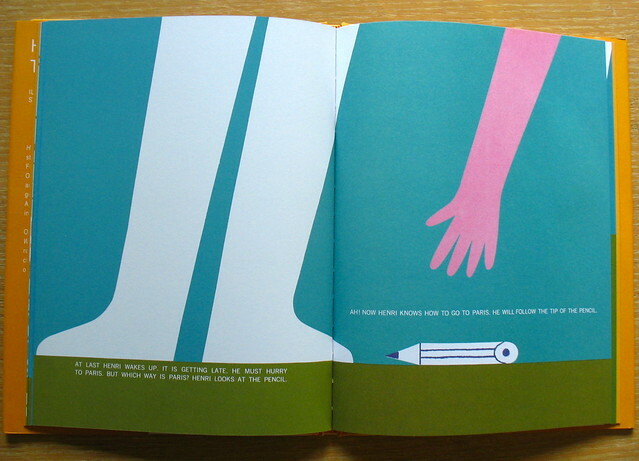 What we know to be a little boy is simply an arm and two legs. 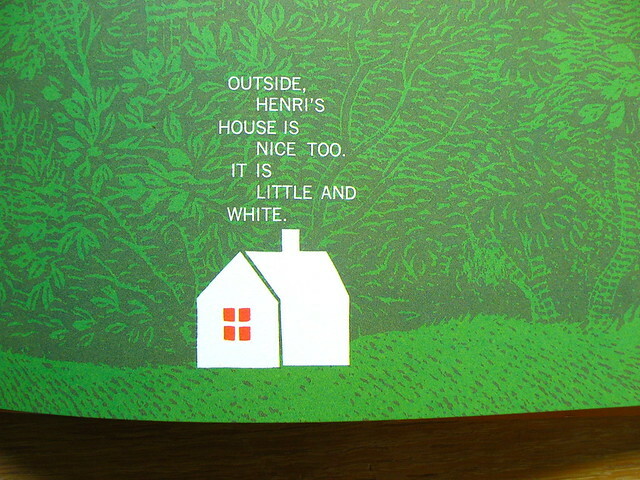 He allows the story to fill in the blanks when it comes to the true character of Henri. When he's given the chance to illustrate people in the little town where Henri lives, Bass resorts to depicting them with WORDS! He doesn't even draw them as shapes with features, just letters with hats. To the graphic designer, this would seem to be a brilliant move on the illustrator's part to showcase people in a children's picture book. Bass is calling the shots here. It's as if he's saying to the reader, "I know you know what these people are and what they do. You don't need to see their faces." And for that, I applaud him. 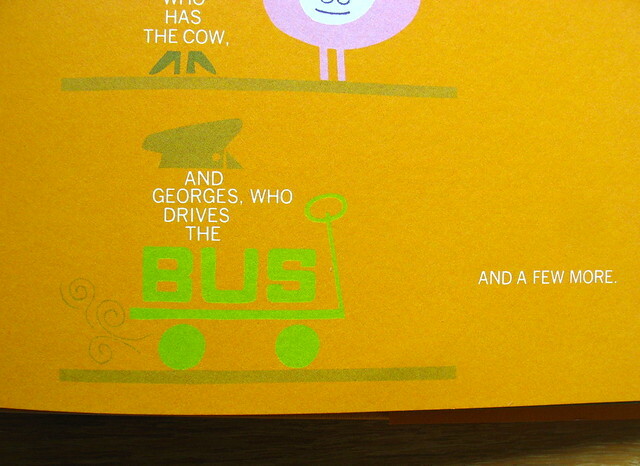 But to be quite frank, the book feels a bit stark because of this fact. Not always, mind you. 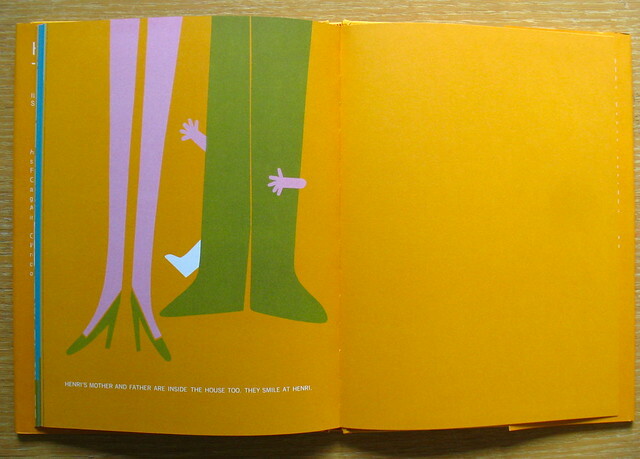 But for some spreads there's a certain human element missing that I feel is needed. The layouts and text placement are amazing to look at, (and the designer part of me totally geeks out on these particular things), but I felt a certain detachment from some of the spreads. 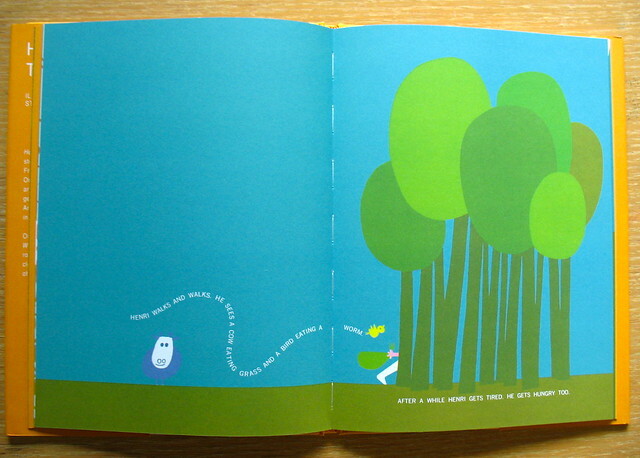 It seems to me that since Bass did not normally draw characters (not his strong suit), he saw this book as a challenge. 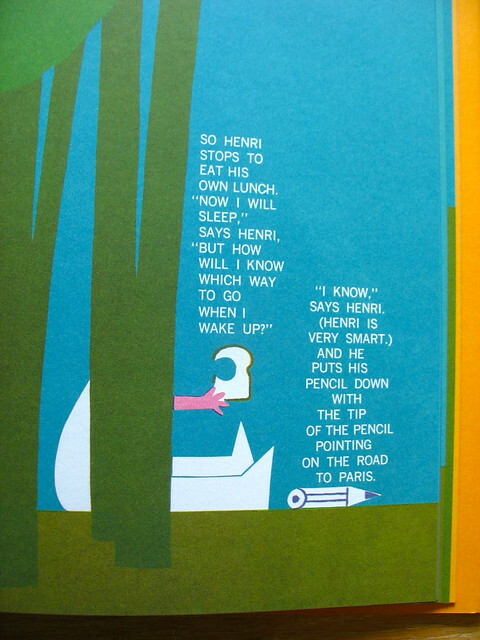 How was he going to illustrate the story of of boy named Henri and his walk to the busy city of Paris? 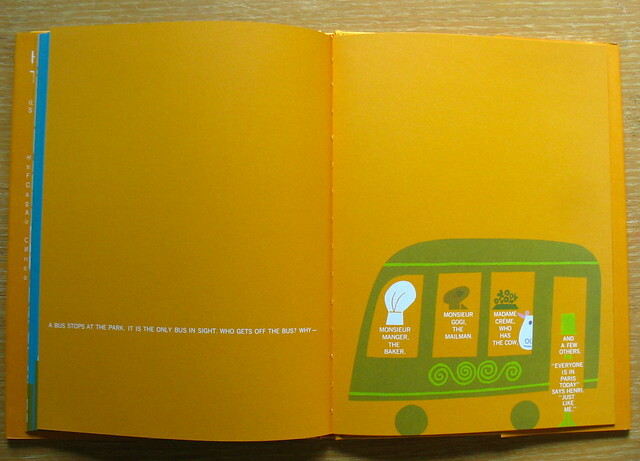 Of course, this is the illustrator in me saying all this. As a Bass fan, I WANT to see Bass draw people. I want to see how he would've characterized the titular character, the townspeople, and Henri's parents. However as a Bass fan, there's a part of me that LOVED how he simplified the characters to just words and letters. A fun shortcut, if you will. You can imagine that yes, I'm on the fence with this book, but I'm probably over-thinking it. Okay, I definitely am. But oh, well. The great thing is that now anyone will be able to buy this book to see for themselves, and not just a book collector with $200 in his/her pocket. 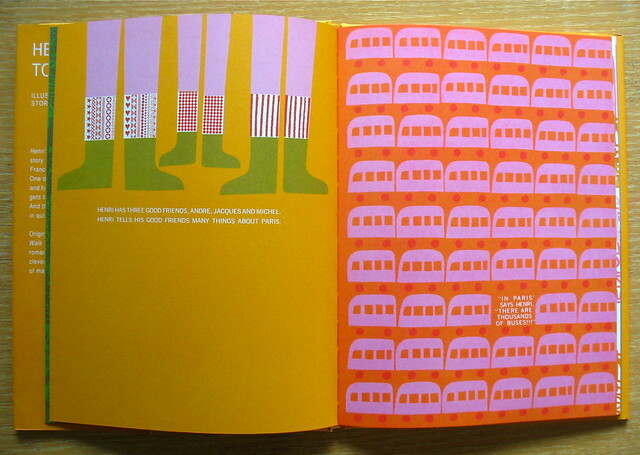 Universe has done a wonderful job of reissuing the book with rich color printed on nice quality paper stock. They did a great job in matching the colors, I must say. All in all, even with all my qualms about the lack of personality and warmth of Bass's characters, the story itself carries the book for any reader. Plus, it'll look great on your coffee table. 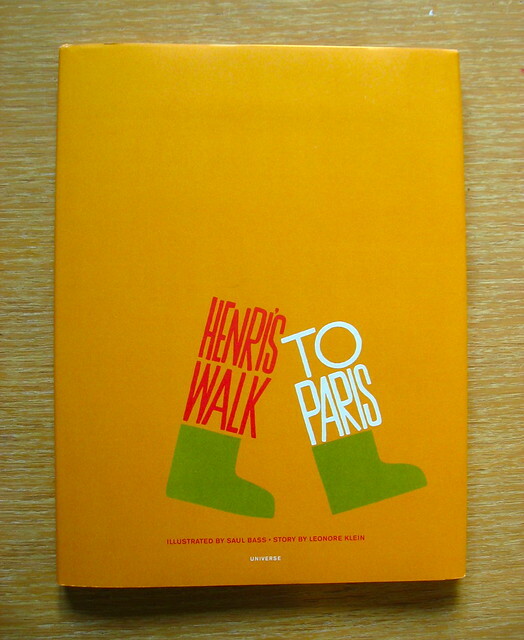 Buy the book: Henri's Walk To Paris. I shot more photos of the book. See the entire Flickr set here.